KEY'S Premium Cold Weather Jacket! The POLAR KING Premium Insulated Fleece Lined Hooded Jacket is the leading choice for comfort and warmth. The heavyweight duck outer shell is sturdy enough to endure the elements during the toughest job, yet soft to the touch from the brushed hand, washed finish. This fabric, in conjunction with the gusseted back and articulated elbows, ensure ease of movement without restriction. Inside you will find heavyweight insulation and fleece lining to provide superior warmth. The heat stays in and the cold stays out with storm cuffs, and elastic waistband and heavy duty zipper! When temperatures are at their coldest, layer this coat over your favorite bibs, pull the hood over your head and tuck your hands into the fleece lined pockets. In no time, you will see why the POLAR KING Premium Insulated Fleece Lined Hooded Jacket is the premier winter jacket offered by KEY. Heavy Duty Wind Blocking Duck Fabric combined with Heavyweight Insulation and a Warm Fleece Lining! 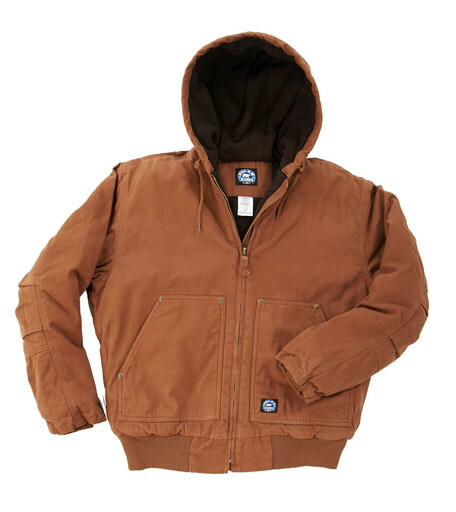 If you are in the Frigid Cold all day long this POLAR KING Jacket will Keep You Warm!